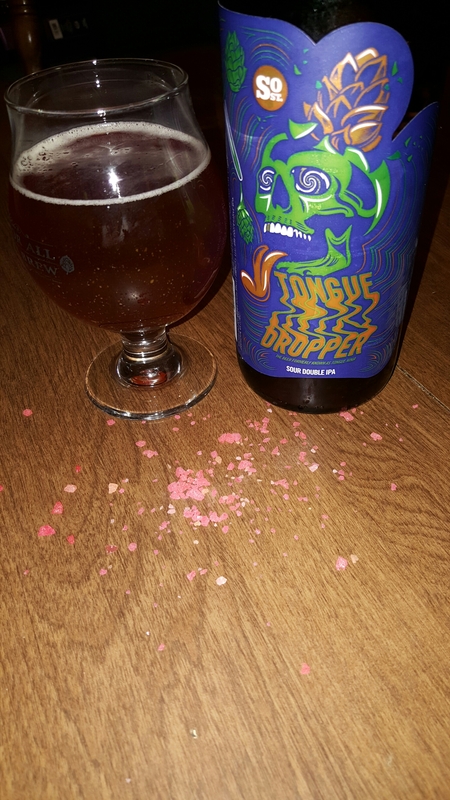 In the third installment of my Mid-Atlantic beers and Halloween candy pairings series , I give you sour ipa and pop rocks! This beer is very hazy, deep red in color with visual sediment . The smell is full of lemon, citrus, and oddly vanilla . The taste was amazing, its not nearly as tart as I expected , nor that hoppy. The citrus flavor shines through with the use of lemon drop hops. There is an almost tangy flavor that just let’s a little sourness linger. The addition of pop rocks to this beer adds a level of effervescence to the beer to make it seem lighter than it is. Strawberry played nicely but I do think the blue raspberry would be a better pairing. South Street Sour ipa came in a 22 oz. bottle and was 8% abv so share with a friend! In conclusion I thoroughly enjoyed this beer. If you find it, pick it up, even if you aren’t interested in a pairing , try this beer!